Image caption Irish Finance Minister Brian Lenihan called the deal reached with the opposition "a good day's work"
The Irish government and opposition have agreed a timetable on passing a vital finance bill. Finance Minister Brian Lenihan said he expected the bill, a condition of Ireland's international bail-out, to be passed by Saturday. Under the terms of the deal, parliament would be dissolved next week and elections could be held on 25 February. Prime Minister Brian Cowen's majority in parliament collapsed on Sunday when the Green party quit his coalition. That capped a disastrous week for Mr Cowen, in which eight of his ministers resigned and he himself stepped down as leader of his party, Fianna Fail. Mr Lenihan chaired Monday's talks with his counterparts from the Greens, Fine Gael, Labour and Sinn Fein, after Labour threatened to bring a motion of no confidence against the government if the finance bill was not fast-tracked through the Dail (parliament). The opposition were also calling for parliament to be dissolved by the end of the week, and a general election to be held in February, sooner than the 11 March date set by the government. "I believe it will be extremely likely now that the next general election will be held on Friday, Feb 25," the opposition Labour's finance spokeswoman Joan Burton told reporters after the meeting. Pearse Doherty of Sinn Fein called the agreement a "grubby little deal" because it avoided an immediate general election. The opposition threat of a no-confidence motion remains if the accelerated timetable for passing the bill is not met but Ms Burton said that was "unlikely". 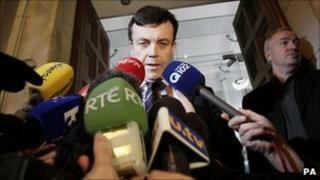 "I think it's a good day's work," Mr Lenihan told the national broadcaster RTE after the meeting. "I think it's important for the country that we are seen to unite at least in dealing with this measure." The Finance Bill will raise income taxes and close tax-dodging loopholes, and it is the final legislative commitment that Ireland must pass as part of its 80.5bn euro EU/IMF bailout package. A spokesman for EU Economic Affairs Commissioner Olli Rehn said it was "crucial" for Ireland's stability and credibility that Ireland passes its finance bill before new elections. There is widespread speculation that Mr Cowen's government will be the first to fall victim to the eurozone debt crisis in the election. The party has to find a leader to replace Mr Cowen and somehow win support back from voters disgruntled by the economic downturn and cutbacks. Nominations for the Fianna Fail leadership closed on Monday and a vote is expected on Wednesday. The frontrunner is former foreign minister Micheal Martin, with Brian Lenihan the bookmakers' second choice. Social protection minister Eamon O Cuiv and Sports Minister Mary Hanafin are also running.